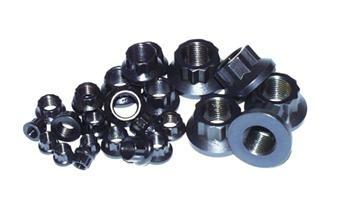 ARP Fasteners - 12Point Nuts UNIVERSAL - Dezod Motorsports Inc - Home of the automotive performance enthusiast since 2002. Available in a variety of sizes to suit your needs, all ARP 12-point nuts are constructed from 8740 chrome moly steel or ARP 300 Series stainless steel material, and meet ARP’s highest standards of quality. Rated at 180,000 psi tensile strength, ARP 12-point nuts are manufactured in thick wall versions for optimum strength and rigidity and thin wall versions for applications with limited space requirements. All 8740 chrome moly steel nuts are black oxide finished and all stainless steel nuts are polished to a briliant luster. ARP 12-point nuts are available in 1-piece bulk, 2-piece and 10 piece packages.